You can’t argue with 1 billion downloads. When a software is popular and included in every debate on file compression What’s The Best File Compression Method? MakeUseOf Tests Zip, RAR & More What’s The Best File Compression Method? MakeUseOf Tests Zip, RAR & More File compression is an important and common task users frequently ask of their computers. Reducing a file’s size makes it easier to email or place on a flash drive. It also reduces bandwidth usage and... Read More , it’s much more than user ratings and adoration. WinZip has won both but does it rest on its laurels or bound ahead with a fresh spring in its steps? Thankfully, it is the latter as the new version of WinZip (that is WinZip 17 Pro) is the most significant update in a long while according to the developers. Like most applications, even file compressor How Does File Compression Work? How Does File Compression Work? File compression is at the core of how the modern web works, one could argue, because it allows us to share files that would otherwise take too long to transfer. But how does it work? Read More has to change its horizons for the new age where social sharing and cloud computing are the new mantra. It’s more than two decades since the first version of WinZip was released. From support for self-extracting archive files to AES-grade encryption, WinZip has gone through the cycle of changes. The majority of the previous changes were under the hood. But the latest roster of changes brings things up front. Full integration with cloud services like Dropbox, SkyDrive, and Google Drive; Facebook, Twitter, and LinkedIn sharing; automatic PDF creation; and image resizing before sharing are just some of the new changes will be putting the spotlight on. That should be enough to tell you whether you should hop over to the site and grab the software. If you are using some other file compression alternative, download the WinZip trial. Even the trial version has enough features to keep you interested. But if you’re interested in winning one of the 25 WinZip 17 Pro licenses for Windows that we have to give away this week valued at $1250, then read on! Version 14.5 of WinZip introduced the Ribbon interface. Familiarity with Office 2010 will make this interface seem more user-friendly even if it’s your first time with WinZip or its latest version. Instead of hiding all the functions under a traditional tool menu, the Ribbon interface makes it more accessible. The interface is also context sensitive. When you launch WinZip for the first time, you are in the Create window. Zip and Unzip processes get their own command Ribbons. WinZip 17 Pro connects you directly to Google Drive, SkyDrive, and Dropbox. Once you give WinZip authorization, you can interact with the Cloud app from within the WinZip interface. You can instantly download and compress any file or folder. WinZip adds little touches like displaying the available free space in the respective cloud account. If you use two or more services, it gives you a better idea of how to organize your zipped uploads. You can use Zip to Cloud and conserve space on your cloud drives. There’s also the FTP option as a secondary for other online transfers. But do remember that all cloud services have file size caps for upload and these will apply here as well. In the new spirit of sharing, WinZip makes it easy to take any file from the cloud, zip it, and then share it with your social circle on Facebook, Twitter, or LinkedIn. ZipShare gives you a status box to share a message while sending a file (actually the ZipShare file link) across. Taking Facebook as an example, ZipShare feels a bit limiting as it does not let you share files with a specific friend, instead you have to choose among your lists and groups from the dropdown. But the other reason you would want to use ZipShare is it allows you to share any file format by compressing it. The older zip and email feature still exists, but now you have ZipSend for all those large files which your email service does not handle. If the file is small, WinZip will launch your email client and send it across. For larger files, ZipSend kicks into action and you can send 50 MB with a ZipSend Lite account and 2 GB with a ZipSend Pro account. You have to sign-up separately for a ZipSend account. Have loads of images to share or upload? Worry not because WinZip can resize photos as they are added to the archive. Images are only scaled down for the sake of conserving space but you don’t have to launch an image editor anymore to optimize your images. You can also convert your Microsoft Documents to PDF for platform independent sharing from the same Ribbon. WinZip also introduces watermarking to protect your digital rights. Using the WinZip encryption feature (AES 128-bit & 256-bit) of course is more iron-clad. Automated archiving has got its own tab. The Pro only feature can run automated backup jobs on the My Documents folder, the Library folder, Outlook folders, and other user specified folders. The Backup tab also includes a very handy Photos option that allows you to connect a camera and directly compress the photos into a Zip file. The world has changed around WinZip with free alternatives Why RAR Is Better Than ZIP & The Best RAR Software Available Why RAR Is Better Than ZIP & The Best RAR Software Available RAR files are smaller, easier to split and easier to recover than ZIP files. These three features mean RAR files are better than ZIP, even though ZIP files are far more common. If you use... Read More and native handling of compressed archives by Windows. But WinZip 17 Pro seems equal to the task. WinZip remains secure with its encryption features and swift with its enhanced compression engine. Barring the still rough on the edges social sharing, there’s very little to complain about WinZip 17 Pro. Download a trial version of purchase a copy fo $49.95. 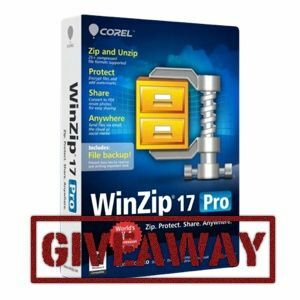 If you’d like to try your luck at winning a free WinZip 17 Pro license, join the giveaway! How do I win a copy of WinZip 17 Pro? Congratulations! If you were selected as a winner, you would have received your license via email from jackson@makeuseof.com. If you require any assistance, please get in touch with Associate Editor Jackson Chung before Feb 20. Enquires beyond this date will not be entertained. This giveaway begins now and ends Friday, January 18th. The winners will be selected at random and informed via email. Explore more about: File Compression, MakeUseOf Giveaway. Look's like another piece of crap software to me. WinZip is a so-so zipping/archive utility, plenty better out there. But instead of trying to simplify and focus and be better at what they exist for, they try to add ton's of feature's no one in their right mind, who isn't on drug's would give a crap for. Make a better WinZip, make it lightweight, functional, and does a few thing's really well. Stop listening to your marketing consultant's who are totally clueless about what real people want. Jeez. where would the giveaway code be??? I do not see it listed. "And then there’s WinRAR. ...RAR is the only sensible choice." All these giveaways hosted here are awesome, so a huge thanks for the opportunity to participate and possibly win goes to Make Use Of and all the vendors that so choose to sponsor each giveaway. I love these things. Thanks! I do not find the giveaway code in Google+ page. The code is in the post that announced the Giveaway on Google+. Find the post announcing the Giveaway on our Google+ page and the code should be there. It has been long since i used winzip. The UI seems to have improved much. Great giveaway! ive only ever used winrar, but i may try this out sometime soon. Never an install without Winzip!! thanks for the giveaway, count me! I rarely us zip programs but I am willing to try the free version and either replace my exiting zip or keep this as a backup. Thanks for this giveaway. I do need one!! Surprised by the look. I've used WinRAR for a long time and never looking back. Since it's still working for me, I guess I'm not participating in this giveaway. Yes, going over to the Ribbon interface is a radical change and so are the cloud features. Though I have Winzip 17 pro by using a key on net still it will be good to win. Good compression sotware but others are also nice. I didnt even think people still use winzip. I have used Z-zip or Peazip for people who just cant or dont want to spend money. They do the same thing. WinZip used to my prime software I use for compression and decompression purposes, then Winrar which had much simpler process took over. However, after incorporating these new features to WinZip including cloud sharing, I might reconsider and give Winzip one more trial. In its present incarnation, I think WinZip is more user friendly than WinRAR. I got this yesterday! Thanks for explaining the ins and outs of it. Awesome! Entered 3 times. Hope I win. Its a good software for zipping files ! Thnx for the give-away ! I haven't thought Winzip is modernized so much. It looks beautiful and functional. Social media sharing!? Wow! I always wanted my archive manager to be able to share on social networks. Now I can tell my Facebook friends how I am zipping up old vacation photos. Wow, great giveaway... I am in. Please don't use this to zip files. Most of the software out there ( which decompress for one reason or another ) support the good old free zipping standard. Actually, most of the programming frameworks have built-in libraries for zipping/unzipping. Proprietary software like this zip files each in their own way and it's very likely to reach something that can't read or uncompress it, especially if you share it. So again, please don't zip with this. This was way back in the day when PKWare and WinZip fought over competing standards if I remember correctly. It especially related to the way encryption was handled by both. PKWARE maintains the file format and ensures interoperability. WinZip supports and is compatible with the standard Zip 2.0 file format, an open source format on which all standard Zip file utilities are based. Been a winzip user - for what seems like forever. It is one of the items I put on every new computer I get.